Planning your next event doesn't have to be a stressful time. Let our professional staff do what we do best. With over a thousand events under our belt, we're confident we will provide you with the perfect location for your special day. The Chestnut Room at Blissful Meadows Golf Club offers a unique venue in which to entertain your guests. Located on the second floor of our historic, Victorian barn built in 1880, the Chestnut Room features the original exposed chestnut beams and beautiful vistas of our 18 hole golf course. The course itself offers many opportunities for photographs, providing natural backgrounds with seasonal foliage, as well as a gazebo area set amongst perennial gardens, an antique horse buggy, and various antique cars. Positioned overlooking Blissful Meadows grounds and historic clubhouse, our new Pavilion holds the bragging rights as the "Highest Point in Uxbridge". This open-air building can accommodate up to 200 guests, and provides sliding doors that completely secure the enclosure from inclement weather. An added feature to this location is the adjacent gaming area for optional yard games included in your rental fee. The Chestnut Room at Blissful Meadows Golf Club offers a unique venue in which to entertain your guests. Located on the second floor of our historic, Victorian barn built in 1880, the Chestnut Room features the original exposed chestnut beams and beautiful vistas of our 18 hole golf course. The course itself offers many opportunities for photographs, providing natural backgrounds with seasonal foliage, as well as a gazebo area set amongst perennial gardens, an antique horse buggy, and various antique cars. The Chestnut Room at Blissful Meadows comfortably seats up to 185 guests, and is handicap accessible via an enclosed elevator. Blissful Meadows’ detail oriented Wedding Coordinators will assist you in creating the perfect wedding day, and will oversee your day from start to finish. 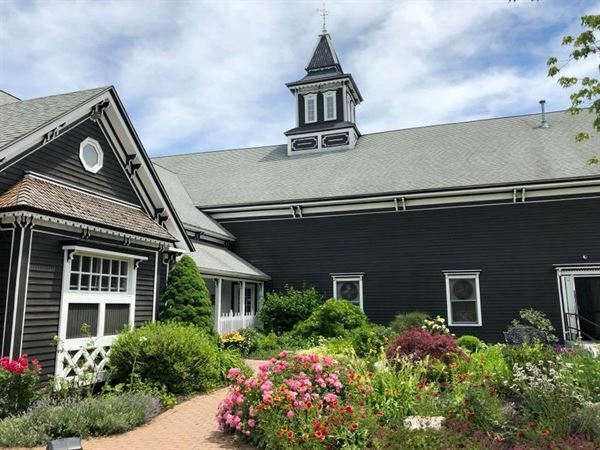 ocated in Uxbridge, Massachusetts, The Pavilion at Blissful Meadows Golf Club was designed to accommodate those searching for a rustic, indoor-outdoor, barn-style venue, in a beautiful setting. Positioned overlooking Blissful Meadows grounds and historic clubhouse, our new Pavilion holds the bragging rights as the "Highest Point in Uxbridge". This open-air building can accommodate up to 200 guests, and provides sliding doors that completely secure the enclosure from inclement weather. An added feature to this location is the adjacent gaming area for optional yard games included in your rental fee. A separate ceremony site with natural wood arbor is located within the Pavilion grounds, and available for an additional fee. The facility offers many opportunities for photographs, providing natural backgrounds with seasonal foliage on the grounds surrounding the Pavilion. Host your next private event in our beautiful function room which features exquisite old school brick and brand new wood floors. Whether it is a fun, casual get-together or a more formal affair we can modify the space to make the event unique and genuinely memorable. This room can be arranged to accommodate small to large cocktail parties, buffets and plated dinners with classic charm. Whether planning an elegant social affair or searching for a unique venue for a corporate meeting or outing. The Barking Dog Ale House offers professional catering services to ensure that the vision of your event comes to life. At The AC Hotel by Marriott Boston Cambridge come explore the possibilities while drawing energy from our artfully edited spaces in our lifestyle hotel. Whether it's a corporate meeting or an intimate gathering, draw energy and inspiration from the hotel itself as you experience a special event that goes above and beyond expectations. Whether you’re traveling to the greater Boston, Massachusetts, area for business or planning a family celebration, Bedford Plaza Hotel - Boston has three to five flexible meeting facilities that are suitable for a variety of uses, from corporate conferences to wedding receptions. Our Lexington and Concord Rooms are located on the third floor of the hotel, and the Pool function and the Bedford Room is on the first level. You’ll find adaptable floor plans that can accommodate Parties for 35, 50, 70, 85, 100 and up to 130 guests. We can accommodate a larger venue up to 220 guests around the swimming pool during the day and afternoon times. We can also provide event catering. Rest assured that our knowledgeable staff is more than happy to assist with your event planning needs.